Women can benefit from protein powder supplements just as men do. The only caveat is that you consume it within your daily needs for protein. You can estimate your daily need for protein by multiplying 0.36 by your body weight in pounds to determine how many grams of protein you need each day. If you are physically active, you need an increased amount of protein. But protein powder itself won’t help you build muscle. Exercise promotes muscle growth. Consult your doctor before starting a protein powder regimen. There are protein supplements on the market marketed specifically toward women, but protein powders generally contain similar ingredients. Choose one that contains a high-concentration of protein itself instead of a long list of additives and fat. Common types of protein powder include whey, soy, casein, hemp and egg powders. Any of these powders can support muscle development in men and women alike, but this is only true if you exercise regularly. Exercise helps break down muscle tissue, and the protein rebuilds it. A 2008 clinical study published in “Nutrition and Metabolism” tested the effects of a whey protein supplement on obese women. One-hundred fifty women between 25 and 50 years old were randomly assigned to a whey protein group or placebo group. The whey protein group consumed two 10-g whey protein shakes per day over the 12-week test period. The results showed little or no difference between the two groups in terms of muscle growth. However, the whey protein group maintained significantly more muscle and lost more body fat compared to the placebo group. This study suggests whey protein supplements may be beneficial in terms of losing body fat and maintaining lean mass. A 2007 study published in the peer-reviewed journal “Fertility and Sterility” studied the effects of soy protein on postmenopausal women. The women who consumed a 20 g soy protein shake per day exhibited less of an increase in overall body fat, but that was the primary difference between the soy protein group and the placebo group. This study showed soy protein does not directly help women build muscle or maintain lean mass anymore effectively compared to women who don’t consume a daily soy protein shake. The key factor for building muscle is consistent resistance training. Two or three resistance training sessions per week is usually adequate. Some protein powders may help you maintain your muscle mass, but resistance training is necessary to build muscle. 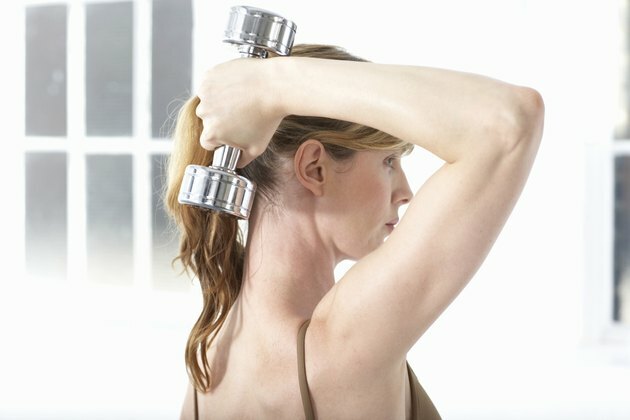 Resistance training can help women burn body fat and tone their muscles. Protein powders may support the muscle development process, but these supplements aren’t right for everyone. Talk to your doctor to determine if a protein supplement would be beneficial to you.